I was watching that popular television show the other day where a bunch of amateur accordionists compete to see who is most talented. I really think that British judge has something against Humppa accordionists though. What is going on? Am I in the middle east? How come everyone is Chinese then? Is that guy bowing on a coconut? Why am I enjoying this? My dear friend, I shall answer all these questions for you: Yes. …what were you expecting? a banjo? Well too bad. Since all of us already know about “Soprano Clarinets”http://www.youtube.com/watch?v=P4HKZrscMrI and listen to them on the radio every day, I decided to pick out a few clarinets that get less attention. Hey don’t let that piano steal New Orleans from you! (Sorry, I had to slip some of my beloved piano in there since I’m not allowed to dedicate the letter P to piano.) Besides the clarrotnet, you also have the bass clarinet. Be sure to click ahead for some Bach Castlevania. Though a member of the guitar family, you have more freedom to move from the upper to lower register in a song. This plus the percussive attack on the strings makes it akin to the piano in voicing and dynamics. Be sure to click ahead for more awesome videos if you’re in the Chapman Stick mood. A legend tells of a blind woman that lived hundreds of years ago in Vietnam. While her husband was off at war, she supported her family by playing a đàn bầu at the market for some extra money. “traditionnaly, Dan Bau was played only by blind musicians. One superstition (even nowadays) is that if you play too much Dan Bau you can become blind. That comment got a +3 rating, so it must be true. Ozzy would wet his diaper in the presence of Vietnamese Ozzy. Be sure to click ahead for some more đàn bầu and a stark contrast of string instruments. The Electone is a line of electronic organs produced by Yamaha. Early models were analog and used tone wheels. Nowadays they are just synthesizers built into an organ form factor. What makes them interesting isn’t their design, but their long-lasting popularity. They aren’t too popular in the U.S. anymore, but the Japanese are still all over those things. You can buy sound banks and sheet music tailored to various electone models, anything from movie soundtracks to video game music. On the other hand if you’re Japanese, you’re probably disciplined enough to do whatever you want. Skip ahead if you forgot about the Kansas/Rush kid. Or take a step beyond music and delve into my personal favorite electone performance. F is for Flexatone. That is all. It’s an instrument that gives you all it can. Nothing more. Nothing less. Well, a gamelan is actually a type of ensemble. It comes from Indonesia in a variety of flavors depending on the island. It consists mostly of percussion instruments like a keybar of gongs, gambangs and a dozen others. Flutes, stringed instruments, and vocals commonly make up gamelan songs as well. These instruments are extremely alien to Western instruments. Not only do they use different scales and tunings from our western notes, their gamelans even have genders! They’re large, expensive instrument sets that aren’t too popular outside Indonesia, but the Swiss have thought of a way to bring them to all our homes. I’ll follow up on that next letter around. Despite its look the hang, (pronounced houng) is actually the most modern instrument I’ve posted so far. It was created by Felix Rohner and Sabina Schärer in Bern, Switzerland in 2000. Its design is the combination of many other percussion instruments, giving it flexibility in a portable size. It produces sounds like a ghatam, plays like a caisa, carries melodies like a steel drum, and resonates like a gong. The hang fits in with many other instruments Just browse around for yourself. You might even hear a hang and a didgeridoo playing together. The igil is a nearly-ancient Tuvan instrument that has two strings tuned a fifth apart. While the sound of the strings are sometimes compared to a cello, the strings are actually dozens of bundled horse hairs or nylon strands that allow for many ambient harmonies to surround the listeners. Some other unique features of the igil are the techniques used to play it, like in the last video where the strings are pushed outwards with the fingernail or tapped to produce quick intervals. Throat singing is well-integrated into the culture of Tuva and the igil is most commonly used to accompany it. Modern, non-traditional, uses tend to be more diverse by mixing together other styles of music and non-traditional instruments. An example would be an igil playing along with a didgeridoo and hang. Music is a mathematical and emotional mixture of rhythm, pitch, dynamics, timbre, and texture. The ancient Chinese jaw harp was one of the first instruments with a flexible timbre, because it used the human oral cavity as a resonator. Simply closing or opening the mouth alters the tone. In southern Siberia a mouth guitar takes the concept from a rhythm instrument to a melodic instrument. It is known as the “Ghost Catcher”. A few thousand years ago in Africa people were busy jamming on mouth bows. Though they are traditionally plucked, you can find instrument players out there who prefer the sustained sound bowing creates. I see potential for some melodies. The kantele is an instrument from Karelia. It is in the Zither family along with the piano and harpsichord, but is plucked by hand like a dulcimer. The kokle is the Latvian variation of the instrument. Other variations of the instrument include the Lithuanian kanklés and the Estonian kannel. All these instruments are thought to have originated from the gusli, or similar Slavic psalteries. Most instruments evolve from other instruments and there are many similar instruments around the world, but the important thing is these instruments have a history amongst people of the Baltic region where they have developed a strong and unique culture. The laser harp is an electronic instrument using laser beams. It is played mainly by electronic music composer Jean Michel Jarre. A laser harp is usually connected to a synthesizer that plays different notes when the beams are broken by the player’s hand. Really, it’s not a practical instrument, it’s just something cool to look at. The mbira, (seen opening the video clip,) is an instrument of African origin. It is sometimes called the thumb piano. Yup, you guessed it – another fiddle. I’m sorry… actually, no I am not. This is quite honestly the coolest looking bowed instrument I’ve done so far. It’s called the nyckelharpa or sometimes called the keyed fiddled. I’m sure when it came out everyone just thought it was a fancy fiddle-ized hurdy gurdy. This instrument’s sound is distinct from any others in that there are 12 resonance strings and 1 droning string for a rich background sound. If you can’t pick out the rich blend of strings in youtube’s poor, monaural audio quality you can at least identify a nyckelharpa by the sound of the keys being pressed. The violin came along some centuries later and was cheaper to make and more versatile. This may have been the reason the nyckelharpa’s popularity faded in mainland Europe. It has actually been on my mind to purchase one for myself, but these instruments aren’t exactly easy to come by outside of Sweden. If you’re looking to purchase one, grab a Swedish-English dictionary, row over to Värmland and ask for a bearded man named Björn. Trust me. You can see his windmill a mile away. Not enough folk for you? I’m sorry, where are my manners tonight? Here’s some lovely Swedish polska for you. Let’s face it. You’re writing the double bass into every measure of your concertos, but you’re not quite hitting the spot. Well the octobass is the largest and deepest violin in the family. The lowest string is actually lower than humans can hear, a C0 (16.25 Hz,) so the open string is good for nothing more than overtones. Musical instruments are classified by the way they produce sound, but that’s a bit of an ambiguous statement. 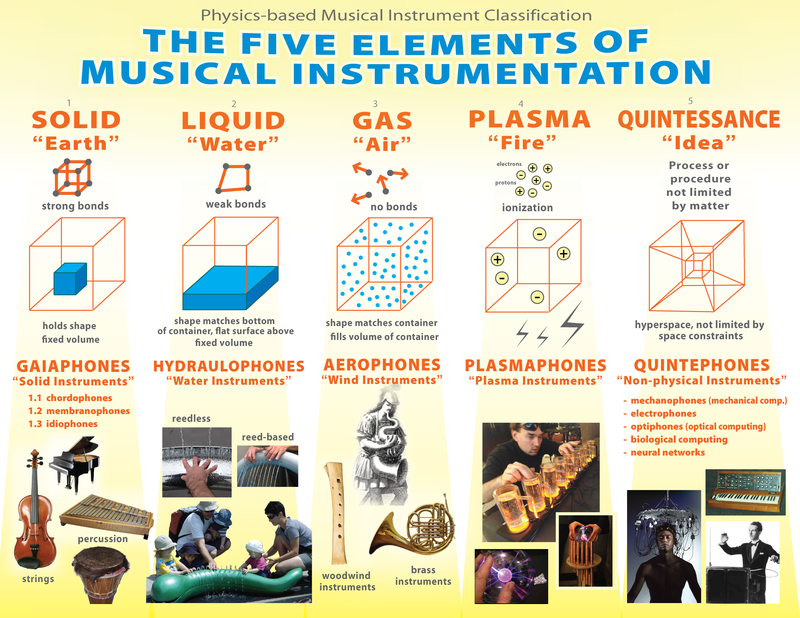 Some people might go as far as saying the basic categories of instruments are the very states of matter that produce the sound, but as you can see in the above link… this gets a little bizarre and messy. Nevertheless, here is an overview of a few of the impractical yet awe-striking instruments that seek to fill the void of plasmaphones in our lives. The pyrophone is typically a pipe organ or calliope run by fire. As you can hear, the pitch and sound of fire are very hard to control. Earlier pyrophones typically used fire to push air through the pipes which made the pitches more distinct, but at the same time that would make it more of an aerophone than a pyrophone, wouldn’t it? Another musical instrument in the plasmaphone category is the tesla coil. Though its primary purpose wasn’t musical, through an analog or digital controller it can become one. In one particularly interesting video I found, there is a collage of instruments from all 5 aforementioned states. The plasmaphone simply being called a plasmaphone. Honorable mentions go to the gas organ, which is powered by fire but still an aerophone, and plasma speaker, which is really just a loudspeaker that requires no human interaction, so technically not a musical instrument in the sense we’re looking for. The quena is a pre-Columbian folk instrument of the Andes. It is one of the most well-known flutes of South America along with the pan flute. According to somebody on Wikipedia, it was also used as a beating stick to threaten children. Be sure to click ahead for some more quena or check out its sister instrument, the tarka, under conductor Gustavo Dudamel (aka “Rob”).